I’ve gone through Chiang Mai about 8 times now, usually spending at least a few days there in between journeys to Pai and Chiang Rai. I realized that in all that time, I’ve never given you guys a post on my favorite things to do there. It’s time I changed that. 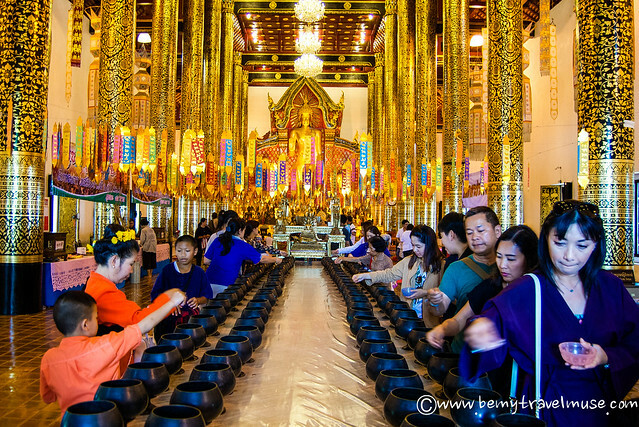 Chiang Mai has over 300 Buddhist temples (wats), so there is no shortage of temples to check out in and around the city. That said, plenty of people can get “templed out,” so I suggest checking out two of the more famous and magnificent ones – Doi Sutep and Wat Chedi Luang. Doi Sutep is located about 30 minutes outside of the old town, but can be accessed by songthaew for around 50 baht per person. It has a cable car which grants access to a vista of the whole city. Wat Chedi Luang is located in the old city, right in the middle. The Sunday night market can, as the name suggests, only be attended once per week. So, if you’re passing through Chiang Mai, try to make it on a Sunday. The market is full of delicious food, clothing, jewelry, art, sunglasses, you name it. It runs right down the center of the old city from Thapae gate. Now that I’ve experienced it multiple times, I actually tend to enjoy walking on the streets parallel to the main one the market takes place on. They tend to have some funkier clothing options and are less crowded. Can we talk about how amazing massages are for a moment? Being massaged with oils for hours for only a few dollars? Yes please, sign me right up. Most massages in Chiang Mai take place in a nice air conditioned room (a luxury in the Chiang Mai heat!) and can be found for as low as 120 baht per hour (about $4!). I usually go for two hours – an hour for feet and legs and an additional hour for head and shoulders. Tips are always appreciated. If you’re confident on a motorbike, the mountains surrounding Chiang Mai are some of the most beautiful in all of Thailand. Full of waterfalls and monasteries, I was truly blown away by the natural beauty. I attended a ladyboy cabaret in Phuket (where I accidentally made it to second base with one of them, but that’s another story), and wasn’t that impressed with the dancing and the price tag. Then I heard that the one in Chiang Mai is really good, with phenomenal dancing, and free. Yes, free! Head to the night bazaar and catch the show at 9pm. All you have to do is buy a drink to gain admission. Be forewarned that if you’re sitting in the front few rows you’re likely to get a lap dance or even get pulled up on stage. Chiang Mai is an awesome city to be in for both Yi Peng and Songkran. Both Buddhist holidays are big all over Thailand, Laos, Cambodia, and beyond, but Chiang Mai is really where it’s at as far as having a great time and being part of a huge celebration. 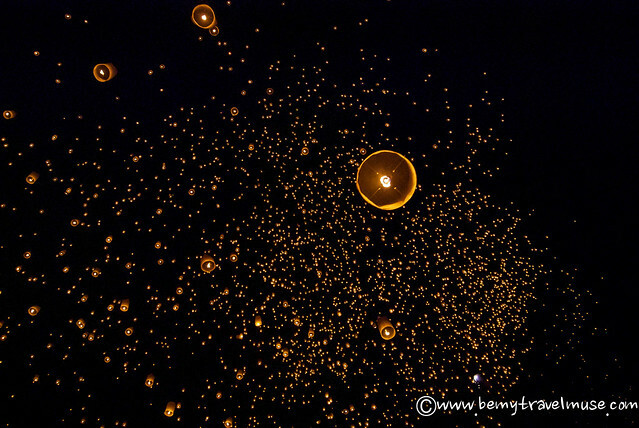 Yi Peng is characterized by a big lantern release and Songkran is basically a giant water fight. I regret that I was on a SCUBA dive boat (well not the diving, but the timing) for the whole of the only Songkran I’ve experienced in Thailand. I aim to rectify that this coming year. I kept putting off taking a cooking course, feeling that I’d be able to follow a recipe book myself if I ever felt like making Thai food at home. I was missing the point, though. There’s technique that was very helpful to learn in the class, not to mention it was tons of fun and really delicious. Considering it cost us 1000 baht per person (about $30), and we made 5 meals plus a curry, I’d say it was definitely worth it. I went with Basil Cookery school which was pretty healthy and very well-run. Call them to make an appointment. I was sad to learn that elephants are tortured into submission during their youth and many lead very sad existences toting tourists around on their backs. I vowed never to ride one, but felt that something was missing from my Thailand experience. Then, I discovered Elephant Nature Park which rescues elephants from tourism and logging and gives them a new lease on life. Elephants here are free to roam, and visitors can feed and bathe them. Check out this post for the full writeup on why this is my second favorite activity in Chaing Mai. A friend of mine asked me to come up with a one-word description for every place I’d been in Thailand. We simultaneously said, “food” for Chiang Mai. Before I started traveling, I just didn’t care that much about food. Sure, I needed it to survive, but it wasn’t that exciting. Then I started traveling and became a full-blown foodie. The first question I ask people when they talk about where they’ve traveled to is whether they ate a certain dish there. When I think about home, other than my loved ones, what I really miss is the Mexican food. I’m already salivating over the thought of returning to Vietnam, and I can’t wait to step outside my flat in Berlin later for some potato salad. The street food in Chiang Mai is delicious and plentiful. It tends to be fresh and super cheap. If that scares you a bit and you’d rather do restaurants, I go with a few main rules: no tablecloths (that comes from my friend James), the restaurant should ideally be full of locals, extra points if the menu is not in English, and you get a gold star if the tables are on the street. While I’m not one to push my opinions on anyone, I’d just like to make it clear that riding elephants, or going to Tiger Kingdom (where the tigers are drugged, not fed properly, and are kept in tiny cages), are two things I strongly caution against. As tourists, we vote with our dollars. Think twice before participating in animal tourism. In closing, Chiang Mai is so full of great things to do, it’s almost impossible to be bored there. Have you been? Is there anything you would add to this list? I went to Chiang Mai several years ago, and the most memorable thing I did there was watch a match of takraw (kick volleyball). I randomly found a match and I had so much fun watching it. That’s a pretty cool experience. It sounds like you got to have a local type of activity that not everyone gets to do. Kudos. I am so interested in the Ladyboy Cabaret. I think I’d be pretty okay with getting a lap dance. Also, eating All The Food is right up my alley. Love your tips on choosing a good restaurant, thanks! If you’re a coffee lover and you’ve been in Asia a while and need a proper cup, there are a few places around Chiang Mai you can get your fix. Akha Ama was our favorite, but be sure to head to the location north of the old city as the prices are 10 baht cheaper than the store on Rachadamnoen Road. Thanks for all the advice. I am already keeping a list of everything for when I finally make it to SEA next fall! I’m sure it’ll be a blast! Nice pics. 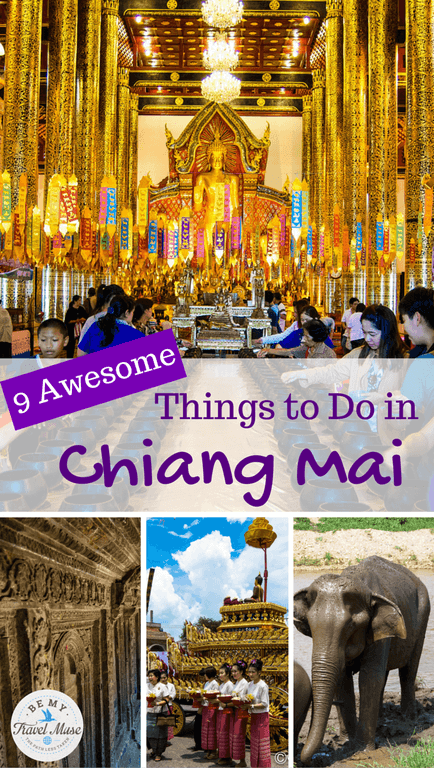 A great list, we loved our time in Chiang Mai and got to do most of these things. thanks for posting nice views. Hmmm chiang mai.. Around how much are accomodations there? I seen a youtube clip of a fellow who rents a nice modern studio for $200 a month there. You can stay in a dorm room for around $3 or less per night. $200/month for a studio seems possible. I’ve only been to Chiang Mai for a few days but I would definitely love to go back, so much more to do! Nice roundup! I’ve done several lady boy shows but never the one in Chiang Mai. Will check it out! Loved Chiang Mai! I can totally understand why so many people fall in love with it. The food options alone could keep you occupied for weeks. They have kept me occupied for weeks! Chiang Mai is a dream base for digital nomads for the food (oh, the variety! ), festivals, and very nice people. Did I mention the rock bottom prices? A fully kitted out bachelor apartment, all bills included for less than $200 a month! It’s only missing the beach, but even that is just a flight away to Krabi now … what an amazing place, can’t wait to go back! agreed there, although I wouldn’t be able to stand it during burning season. We also loved Song Kran and of course our time at Elephant Nature Park! can live like a king out there. A lot of people do! File that under eat everything – agreed! Oooh brutal! I don’t think I could have handled that. Why am I the only traveler in the blogosphere who hasn’t been to Thailand?!? I met an American called Jury a few months ago whilst I was travelling back to Bali. He recommended your site and I really love what you write about. On this post, I was wondering if there’s not anything else you would have added, such as Muay Thai or the travel writing course I read about. Would you say you liked them? I haven’t taken a travel writing course, but I did attend a Muay Thai fight and that was cool. I did see kids fighting and I didn’t know how to feel about it, so I left it off the list. I’m back in NY and I’m desperately craving the fruit smoothies. I am so glad that you mentioned not going to Tiger Kingdom or riding elephants. I run into so many tourists who are unaware of how bad this is for the animals. Thanks for increasing the awareness!! It’s horribly bad for them considering how their spines are oriented. I can understand for most tourists – myself included – this would not be obvious and isn’t something one would know about without awareness. Thanks Craig. I never knew how amazing food could be until I started traveling. Now it’s a big motivator for me. Love love loved chiang mai! Was by far my favourite place in Thailand and I can’t wait to go back! The only things I can think to add to your list is going water rafting and trekking through the jungle, both amazing! I wasn’t excited about water rafting, it just came as part of my trekking package, but I had so much fun doing it! Also noteworthy are the people if chiang mai. They’re absolutely beautiful. Locals down south can be a bit jaded when it comes to tourists, but in chiang mai if had locals (not even trying to sell me anything) come up to me just for a chat. Ahh take me back now!! You know I agree about the locals. I think in the north, and on Koh Chang as well, they’re very friendly and I would love to try rafting through the jungle. Thanks for the suggestions! Awesome spot! One of my fave on earth. One note on Tiger Kingdom; having read accounts from multiple, Western volunteers at the facility (which may or may not add to the veracity of the testimonials ;), the tigers are not drugged. They work with, feed them, and are around them all day….and if they claim it, and work there for free, I gotta go with them 😉 But either way, it’s so key to do what vibes with you, and I side with you on the elephants thing, because it is backbreaking. As for the kitties, they sleep up to 22 hours a day in Mae Rim or the wild lol….and as I’ve heard from more than 1 person who’s been at Tiger Kingdom during feeding time, you’ll know they aren’t drugged when their ice blocks come out on a hot day! I still wouldn’t trust that the volunteers, most of whom are there for a few days and almost none of whom stay for over a month, are really in on all of what’s going on at Tiger Kingdom. I’ll also point out that the Tigers are fed chicken instead of red meat which they need in order to be healthy, are kept in small cages, and hit with chairs and bamboo poles. People can try to justify it by saying whatever they want but those facts are undeniable. Where’s all that money going? Towards building temples. I can’t and don’t support that. I was born and raised in L.A. by someone that was born and raised in L.A. and one thing I can say for sure, in traveling to places near and far, is that I have taken for granted that you can get GOOD Mexican food pretty much anywhere in So.Cal. You don’t have to go hunting, or paying out the booty to get a legit lengua taco- they’re everywhere. On a somewhat related note- When it comes to Mexican food and Chinese food in So.Cal I had a rule: Stay away from A grades and focus on the B and C graded joints, they tend to have the best tasting and most authentic food. My favorites are the ones where it’s just one lady in the back making food homestyle, line out the window of the kiosk, and nowhere to sit – take away only and there are lines of people munching on it like it’s street food. So perfect. Hi, will be in CM for 5 nights and was thinking of doing a trek to the Northern region for a night or 2, any suggestions? I haven’t done one myself but I’d caution against treks that include elephant riding. Most of them have that element to it and it’s really bad for the elephants. I’m sure there are wonderful local treks that can be organized through any guesthouse. You can also check the Thorntree forum on Trip Advisor which I find really helpful. I can’t wait to visit the elephants. I’m conscious I don’t want to promote anywhere where they’re maltreated, but I’d love to see them in a sanctuary! Chiang Mai sounds great – plus it looks like I’ll be there on a Sunday! I miss Chiang Mai so much! I will certainly have to visit Pai when I go back. LOVE your blog, will be reading as many of your articles as I can before I go on travels (first time solo female!).. I am planning on spending a few days in Thailand before flying to Chiang Mai to save time. Am I missing anything absolutely amazing on the way by not going by bus / train – I know there will be plenty to see on the rest of my trip! Do you mean in Bangkok? Chiang Mai is in Thailand. Yep I did mean Bangkok! There seems to be so many amazing places to stop at but I will have around 8-10 weeks to travel Thailand, Laos, Vietnam and Cambodia (then another few months for Phillipines, Indonesia and back up through Thailand) and it is so hard to know where to plan on going! Am trying to get rough idea of dates and where is a definite stop off. Reading through lots of articles like yours is so helpful, thanks!! The comments on this website encouraged me to travel to Chiang Mai, not ready for Bangkok yet, my plan is to attend a two month Muay Thai training camp with a room included, I’ve been looking at the P. Silaphai Thai Boxing Gym. Does anybody here have been to any of this type of training for a long term? Thank you Kristin for this awesome blog!